Apron feeders are often a critical component in any mineral processing operation, providing a link between areas such as primary crushers or stockpiles – with the rest of the plant. In many cases, if the apron feeder fails, the entire plant stops and incurs extended unplanned shutdowns. H-E Parts supplies a complete range of CME™ feeder pans and associated parts to the minerals processing industry for a wide range of applications. H-E Parts are also adept at providing complete Apron Feeder solutions with in-house engineering and manufacturing capabilities. This affords our customers with customized modular feeders that improve total cost of ownership and maintenance efficiencies. 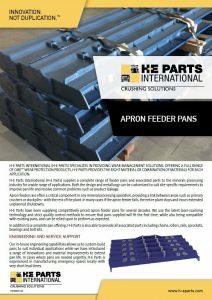 H-E Parts supplies apron feeder pans in manganese steel for a wide range of applications and can customize these parts to suit individual requirements. Both the design and metallurgy can be customized to improve pan life and resolve common problems such as product leakage. In addition to a complete pan offering, H-E Parts is also able to provide all associated parts including chains, rollers, rails, sprockets, bearings, and bolt kits. 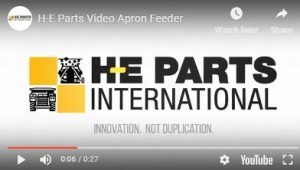 H-E Parts have been supplying competitively priced apron feeders and parts for several decades. We use the latest laser-scanning technology and strict quality control methods to ensure that feeders and pans supplied will fit the first time, while also being compatible with infrastructure, and can be relied upon to perform as expected. Our in-house engineering capabilities allow us to custom-build pans to suit individual applications while we have introduced a range of innovations and material improvements to extend pan life. In cases where pans are needed urgently, H-E Parts is experienced in manufacturing emergency spares locally with very short lead times.